Having pets is a privilege many of us enjoy, and while little things such as shedding can be aggravating and unsightly, it is a small price to pay for having such loveable companions. The shedding of hair is connected to daylight hours and diurnal changes, something which not everyone knows. This means that as we emerge through winter and enter spring, increased daylight (both length and intensity) stimulates better hair growth, meaning more hair is being shed and replaced. It therefore follows that dogs that are kept inside shed continually, as they are not susceptible to the daylight changes in the same way that outdoors dogs are. Outdoors-living dogs will usually shed as the days lengthen coming into spring, and this occurs when the thicker coat that has insulated the dog through winter is shed and replaced with a lighter coat for summer. Cats that roam freely outside are also more affected by seasonal shedding. Contrary to popular belief, short-haired breeds are bigger shedders than their long-haired counterparts because their hairs have a shorter life cycle. This means they are constantly being shed and replaced. Single-coated breeds with only a topcoat are often referred to as ‘non-shedding,’ although this is not the case. Dogs with no undercoat do shed, but it is usually less obvious when this happens. Hairless breeds shed too, but they shed skin rather than hair. So why do our pets have so much hair, why does it shed, and why is it so important we keep up regular grooming? Well, like humans, pets have hair for survival. Hair protects, insulates and aids in communication. It is the first defence against the environment and acts as a shield against parasitic invasion and the contraction of harmful micro-organisms. Hair in the sensitive ear canal protects the vital parts from damage, just as hair on the paw pads provides a protective and insulated cushioning for walking over snow and ice. Without hair, our pets would be more vulnerable to infection by foreign particles. Not only this but hair insulates the vital organs and helps to regulate body temperature. In winter, the thicker coat insulates the body against the cold and in summer a much lighter coat replaces the old, helping to prevent discomfort and heat stroke. Like when we are cold, the hairs on our arms stand on end as they try to trap in warmth. This is no different for dogs and cats. In animals, hair is the receptor for many things, including temperature, touch and pain. It also lends a hand in communication and in times of stress an animal’s hair will stand on end (piloerection); this is caused when released adrenaline makes the muscle connected to the hair follicle contract, lifting the hair away from the body. This is perhaps more obvious in cats when they are scared. So, hair is important. It is also important that we remove this hair when it becomes loose and sheds. If we don’t, not only will there be more hair covering the floors and furniture in our home, but our animals are likely to suffer. By removing loose hair through regular grooming, the hair renewal process is helped, as new hair can grow in place of dead. The hair follicle is also stimulated and the secretions from this go towards improving coat shine and weatherproofing the hair. Grooming also stimulates the skin and encourages better blood circulation. Besides this, dry skin cells and dandruff are removed in the process of grooming, enhancing general appearance and coat health. You are also more likely to notice parasites if you groom regularly, including troublesome ticks which can carry and transmit the Lyme bacterium. To find out about Lyme disease and ways to prevent it, please click here. 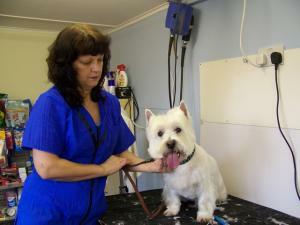 If there are any other changes to your pet’s skin or coat, you will notice them more easily by grooming regularly. Noticing things early often means more effective treatment. Hairballs are a particular problem when it comes to cats, which spend a vast amount of their day self-grooming. The rough nature of a cat’s tongue makes it easier for them to unwittingly consume hairs which accumulate quickly in the digestive tract and stomach. Although cats are used to ingesting large amounts of hair through self-grooming, sometimes hairballs can cause blockages in the intestine and occasionally, rare stomach disorders. While hairballs will usually be vomited up, some are too large to be dispelled from the body and can cause uncomfortable obstructions. If your cat is groomed regularly, less loose hair will make its way down the oesophagus to cause problems, something your cat will really thank you for. A great tool for preventing hairball formation is the FURminator, which can be purchased from VioVet. To view our complete range of dog grooming products, click here, and for cats, click here. VioVet also stocks effective products for the management of excess pet hair in the home, including the CarPET Hair Remover, which is great for use on-the-go, and the trusty Pet Hair Filter Bag, which helps to prevent washine machine and drain blockages resulting from clothing that is covered in pet hair entering the machine. If you have any further tips on pet grooming or removing hair from your home, please share them with us! I find with a double coated breed, an Undercoat Rake in addition to a slicker type brush is great. I use the Undercoat Rake mainly in summer and the Slicker as his daily brush. My dog has a very thick coat around his neck and back and thinner short coated on the rest of his body. He is a cross breed and has a lovely coat mixture including the Chihuahua teflon quality that I love! He loves to be brushed as it's attention and he gets a treat after! The most important thing is to make sure you are gentle and the brush isn't pulling the fur too much.